Today’s review isn’t software. In fact, it doesn’t even use electricity, but there is a lot of technical research behind it, and it is designed to prolong the life of your legs, and your laptop. I’m talking about the ThermaPAK HeatShift Laptop Cooler, a laptop pad that cools your laptop through thermal conductivity instead of using USB power driven fans that will eventually clog with hair and dust and create a horrendous noise. The HeatShift Laptop Cooler is made by ThermaPAK Technologies and is available for 13 inch, 15 inch, and 17 inch laptops. The cooling pads come in black or pink, and are sized for the typical footprint of a PC laptop. This means that the 15 inch pad is 13.5 inches by 11.5 inches and about a half an inch thick. But it is a bit hefty, with the 15 inch model weighing in at 23 ounces. There is also a white version that is sized to fit under 13, 15, and 17 inch Mac laptops. So that 15 inch model weighs just as much, but is 14.5 inches by 10.5 inches. If you buy from the ThermaPAK online store, the 15 inch pads run $29.99 regardless of color, with the 13 inch models two dollars cheaper, and the 17 inch versions five dollars more. ThermaPAK does have a number of resellers listed on their site and you may even be able to find them in a computer store near you. We did a quick look at the online resellers and were surprised at an odd three way tie for lowest price. Coming in as the most consistent was Buy.com, where a 15-inch ThermaPAK was priced at $22.99, regardless of color. If you want a black one, you may want to consider shopping at PC Connection, where a Black 15 inch pad was priced at a low $20.05, while the White and Pink versions in the same size were seven to eight dollars more. If you favor one of the other colors, look at Provantage.com, where the White and Pink 15 inch pads are $20.76, but the Black is oddly $29.53. Of course, these prices are just a snapshot, and they may change by the time you are reading this article. ThermaPAK also has a Competitive Upgrade Program, where they will sell you a pad at a reduced price if you send them your existing cooling pad from another vendor. But you’re better off looking at that on their site if you’re interested. And they also make 15 inch and 17 inch basic Laptop Bags out of the same materiel as their cooling pads. But for now, we’re just looking at the pads. 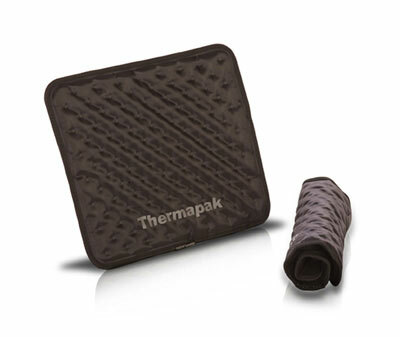 The ThermaPAK pad uses HeatShift technology (ThermaPAK’s trademarked term) to provide cooling for your laptop. What this means is that the cooling pad that you put under your laptop is made of a thermally conductive fabric, and filled with specially conductive crystals developed by ThermaPAK. At room temperature, these crystals form small hard grains that will move around each other, allowing the pad to be flexed and folded, and even rolled up for storage. When exposed to the heat of your laptop, these crystals melt, absorbing the heat and spreading it out to the surrounding area. As the heat is spread out, it dissipates, allowing the crystals to reform. So in use, the pad is filled with crystals going in and out of liquid state as the heat from your laptop is being spread out and dispersed. So how do I demonstrate to you that this really works? After considering a number of methods, I decided to use SCIENCE! The Problem: to demonstrate if the ThermaPAK really does help disperse heat from a laptop. The Approach: Record the temperature profile of a laptop (in this case a MacBook Pro) on a hard, flat surface (a wooden table) from cold startup for a period of 2 hours. At the two hour point, insert the cool (room temperature) ThermaPAK pad between the laptop and surface. Record the temperature profile for an additional 2 hours. The Data: I conducted this experiment at home, in a room kept at 72 degrees Fahrenheit. I recorded the following temperature data on my computer using Temperature Monitor. You will probably want to open this image up in a separate window. I know that there is a lot on this graph, but I think it shows some interesting information. The line that most people will be interested in is the red line on the bottom. This represents the temperature of the bottom of the laptop enclosure. This would be the temperature of the laptop against your leg if you set it on your lap. It took me a couple minutes to boot up the laptop and activate all the sensors in Temperature Monitor so I could graph the data. In that small amount of time, the bottom of the laptop went from the ambient 72 degrees, up to the minimum recorded temperature of 82.4 degrees. As I used the laptop for the next two hours, the laptop’s temperature rose steadily until it topped out near 95 degrees about an hour and a half into the experiment. It hovered at that point until I put the ThermaPAK under it at the 2 hour mark, indicated by the dotted cross hairs on the graph. 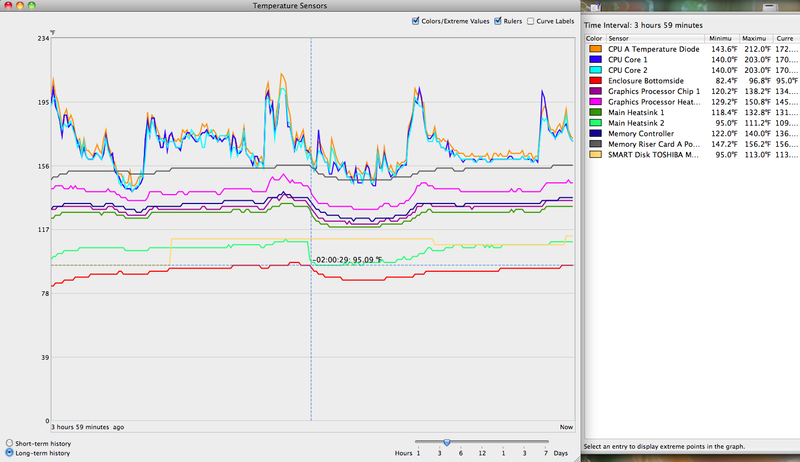 Notice that after the ThermaPAK was in place, almost all of the sensors experienced a pronounced dip. Even the widely varying CPU sensors display a general decline over most of the next hours, despite the fact that I continued to use the computer. Only the hard drive sensor failed to report any changes due to the introduction of the ThermaPAK. The laptop enclosure experienced about a 10 degree drop in temperature, and then started to heat back up again, although at a much slower rate. It wasn’t until the end of the experement, 2 hours after the introduction of the ThermaPAK that the enclosure resumed its former temperature. The Conclusions: It appears that the ThermaPAK is effective at conducting heat away from your laptop and into the environment, but that capability is limited and only buys you about two hours of cool down time. At the end of that time, the laptop will be back up to the temperature it started at. If your intent is to keep your laptop cool, this may not work for you. But our primary purpose in looking at the ThermaPAK was to keep the laptop from burning your lap. That, it does admirably by more evenly distributing the heat across the surface of the pad. Although a tad heavy, the ThermaPAK does form a formidable barrier to heat. My wife has been using the ThermaPAK for several months now (she has more of a lap than I do, and is more willing to put her laptop upon it), and she just loves it. It keeps her legs from being burned and is comfortable and easy to pack into a suitcase, briefcase, or laptop bag. This may not be everyone’s cup of tea, but if you’re fond of the odd bit of computing in bed, the ThermaPAK is a great way to keep your laptop from getting overheated as it sits on your bedspread. And on top of that, it doesn’t drain your battery life. Very interesting. Is there comparative temperature data for a powered cooler? Previous post: #FollowFriday – @Cirque: Gateway to wonder, behind the scenes at Cirque du Soleil. Next post: #FollowFriday – @Cynical_Woman: Cartoonist, writer, blogger, podcaster, mother, and devilish cutting wit.